Edna and Ed Hogan Jr. ’44 spent their lives embodying honesty, kindness and sacrifice. 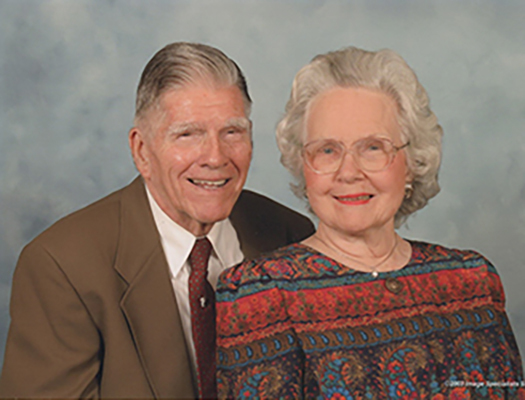 Although the couple has passed away, their legacy at Texas A&M University lives on through a charitable remainder unitrust (CRUT) they established to support the university. Maureen Storie ’86, their youngest daughter, remembers her parents’ hard work and generosity. 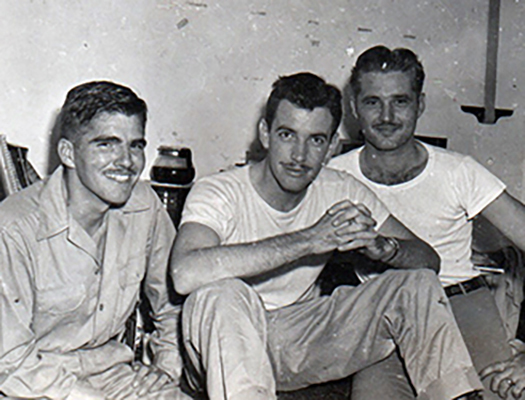 Ed Hogan (far left) with his roommates in Walton Hall in the fall of 1946 after he returned from the war. Ed received his Army discharge in September 1946 with the rank of Captain. For Storie, the Aggie spirit played a prominent role in her upbringing. From the annual Beaumont A&M Club Watermelon Party to a small figurine of Ol’ Sarge that sat on the family’s kitchen countertop, she appreciated what Texas A&M meant to her dad. She loved meeting former students around her community and took pride in calling herself an Aggie at school. She was the youngest of five daughters, and although she was the last to head to college, she was the first to attend Texas A&M. Edna and Ed were hometown sweethearts who grew up in Beaumont, Texas. Ed was a member of the Corps of Cadets C Company Engineers until he was called into service with the U.S. Army his senior year. When he returned from overseas, he felt it was time to enter the workforce and begin a family. The couple married after WWII, raised their daughters and built a life in the community they knew and loved. Ed worked at Mobile Chemical and spent his free time putting his mechanical engineering knowledge to good use, tinkering with cars, home appliances and his daughters’ broken toy dolls. The Hogans lived a quiet life. They never spent beyond their means and they worked hard to provide for their daughters. Ed and Edna Hogan established a charitable remainder unitrust in 1992. This fund continues to benefit their daughters and Texas A&M since the couple’s passing. Family, education and giving back were important to the Hogans, so in 1992, the couple established a CRUT. The trust would provide distributions to the Hogans for their lifetime and then to their daughters for a term of five years, and finally the remainder would support Texas A&M. Investing in a charitable remainder unitrust through the Foundation was a big decision, but the couple saw it as a way to serve the university they loved after they passed. With a CRUT, the donor (or beneficiaries selected by the donor) receives a series of payments generated from the CRUT for a predetermined number of years or for the remainder of the beneficiary’s lifetime. When the time period is up or the beneficiary passes away, the Foundation receives the remainder of the trust’s assets, which are used to benefit Texas A&M according to the donor’s wishes. With Storie’s son now at A&M and the same Ol’ Sarge sitting in his dorm room, Ed and Edna’s Aggie spirit lives on. While the Hogans would not have considered themselves anything other than ordinary working people, their humble service and sense of philanthropy will shape their long-lasting legacy.